Please Note: Although Citrine may not need clearing/cleansing as often as most crystals, we suggest clearing your Citrine as often as is needed, based on (1) the amount of use it gets (how hard is your crystal working for you?) and (2) the amount of energy that your crystal has been exposed to over a period of time. When clearing your crystals, always make sure that your intent is clearly stated, so the crystal knows that it is being given some time off and needs to recharge itself. See this informative article on how to clear/clean any of your crystals: https://www.healingcrystals.com/How_to_Clean_Crystals_Articles_11358.html. NOTE: There are two types of Citrine on the market. The first, most common variety is heat treated in order to obtain a bright golden yellow/orange color. Heat-treated or "enhanced" Citrine is a very popular and useful stone. The intensity of the color brings an additional intensity to the stone itself. 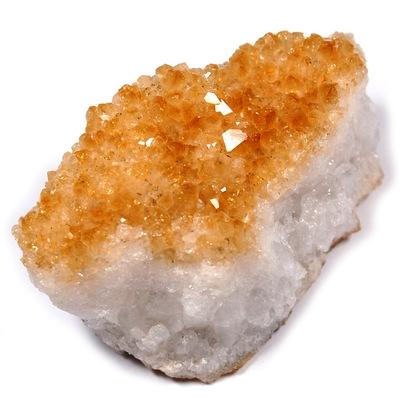 The second type of Citrine is natural Citrine. This Citrine has not been enhanced in any way; in fact, it is the same color as it was coming out of the mine. Natural Citrine, which is a pale, golden color, is not as abundant as its "enhanced" counterpart. Natural Citrine provides for powerful healing on many different levels and carries a cleaner, smoother vibration. Click here to see Citrine in our online catalog.